One of The Flash’s most daring choices last year was the inclusion of Gorilla Grodd, a classic Flash enemy who happens to be, as the name suggests, a gorilla. But not just any gorilla. A super-intelligent simian with immense psionic powers. Despite difficult circumstances that come with bringing a far-fetched character to life, the show not only forewent caution and embraced its comic book roots, but did so in compelling fashion. Grodd returned for his second tour of duty in last night’s “Gorilla Warfare” and while the visuals were once again spectacular, the meeting between he and our Scarlet Speedster was lackluster. I expected fireworks, given both the show’s current string of fantastic episodes and Grodd’s strong first appearance last season. Instead, we were given an entry that felt transitional, staving time until the forthcoming Flash/Arrow crossover. Because this is still The Flash, the hour retained the usual level of entertainment, but just didn’t delight in a manner I anticipated give the groundwork laid in Season One. The hour picked up with Barry nearly recovered after last week’s beat down, courtesy of Zoom. The defeat left Barry downtrodden and he spent much of the episode’s first half with a serious case of the grumps. Our hero’s injuries, and his subsequent mental instability, were understandable. But, the specific injuries felt like an unfair bait and switch by the writers that was unnecessary. Barry was not just battered at the end of “Enter Zoom,” he was broken and left paralyzed from the waist down, implying that his abilities may have been affected. Of course, they weren’t and with his expedited healing ability, Barry was good as new in record time. The real trouble was the show didn’t do anything of note with Barry’s temporary paralysis, therefore not warranting its inclusion as last week’s shocking tag. A rare, and disappointing, misstep by the writing staff, albeit a small one. I did like the idea to get Barry out of his funk: bring in Henry Allen. Henry’s sudden departure is the season’s grandest mystery (Zoom’s identity notwithstanding), and it was nice to see he hasn’t been abandoned. The best part of the episode was its impressive visuals, The Flash once again showing its mettle in regard to effects work. Grodd wasn’t shrouded in darkness the entire hour, either. He was shaded often, but we were also given full, direct shots that held up well to scrutiny. The show also did a great job, as it did last year, displaying the gorilla’s powers. Controlling people with your mind is not the easiest thing to illustrate on screen, but The CW action drama made it look so. I just wish we had been given the opportunity to see those impressive visuals and powers up against The Flash at his best. I hoped for an ambitious fight, but the battle played out like the others in Season Two, built on cleverness with a bit of action peppered in for flavoring. One refreshing aspect of “Gorilla Warfare” was the repositioning of Grodd as less a villain, and more a victim. Though he kidnapped Caitlin, she was his biggest defender, reminding the rest of Team Flash that Grodd gained his intelligence and powers against his will. This continues the trend set this year in which the weekly villains have been miscreants, but also victims, forced to hunt Barry if they ever wish to return home. Jay Garrick was once again absent from the hour and, as the weeks grow on, his position in the show becomes muddier. Once Harrison 2 arrived in town, Jay has been relegated to the bench. The explanation for his sudden disappearance is simple, that Harrison drove him off by being a big ‘ol jerk. The reasoning may be sound, but I wish the writers would find a way to include Garrick, sooner rather than later. 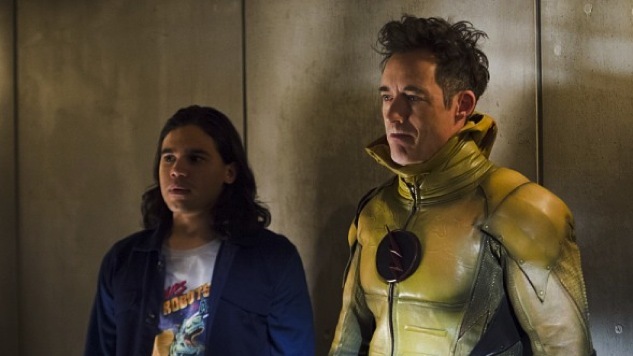 I liked the dynamic he brought to Team Flash, particularly once Harrison 2 showed up. Plus, we still have to figure out what happened to his speedster powers, but I suppose there is time for all that. Another character that, while still present, has become a ghost is Iris. The writers did a commendable job giving Iris something worthwhile with her estranged mother arriving in Central City, but since that storyline’s quick resolution, Barry’s former love interest has become a shell. She was given the task this week of breaking Barry out of his grumpy state, which she accomplished by calling in Henry. It was a sad workaround to give Iris something, but she remains the most underutilized and, frankly, extraneous member of the cast. On the other end of the spectrum, the progression of Cisco this season from supernerd to superhero has been a joy to watch. His transformation into Vibe has given Carlos Valdes a whole new arsenal with which to play, and offered Team Flash with a welcomed tool against their Earth 2 intruders. In this episode, Cisco’s abilities worked as a way to introduce Kendra Saunders as Hawkgirl, a character that will soon be on Legends of Tomorrow. Both The Flash and Arrow have done a nice job including Legends build-up within their own seasons, not allowing the shiny new show to dictate what is happening in their worlds. The fact that Kendra appears to be from Earth 2 is the most intriguing bit of information to come from any of the Legends pre-show festivities, but I am not certain it will lead to any interesting developments, or just be a character trait. ?“Gorilla Warfare” was not the Grodd encounter I hoped for, bringing The Flash down from its cosmic heights of weeks five and six. Worse, the show can’t remedy the issue immediately as it’ll take a week off for Thanksgiving. There is good news, however. When The Flash does return on December 1, it will be for the much anticipated Arrow (and Legends) crossover episode. Last year’s event led to one of the most thrilling hours of the season, and rumors have it this year will be even bigger. If the rumors are true, the crossover will more than make up for the action I was denied last night. It’s safe to say, fireworks will be provided.